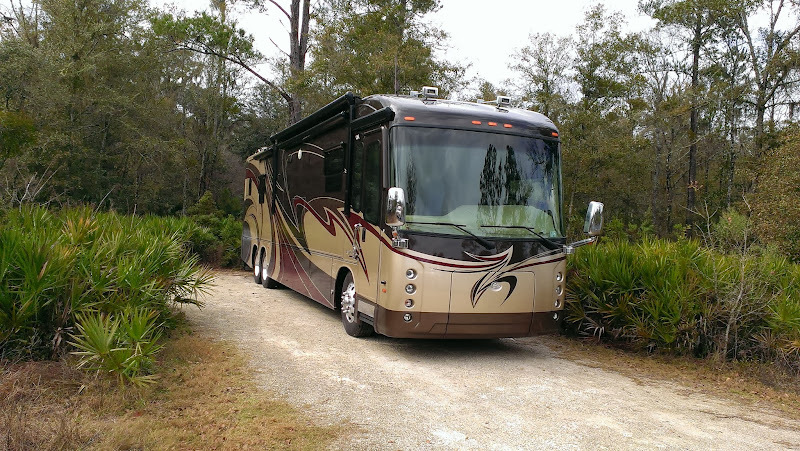 Our original plan after the RV Show was to stay in the Naples area for a week. We’ve driven through Naples several times before we had an RV but had never stayed in the area so we thought this would be a good opportunity to visit there. After the hectic-ness of the RV show though we ultimately decided that we were more in the mood for someplace quiet and closer to nature instead of a touristy area. At the last minute we were able to get reservations at Rainbow Spring State Park in Dunnellon which had been recommended to us by friends, Leta & Scottie. So glad we changed our plans! And just $12/night (for FL residents). Knowing we only had a 75 mile drive to Rainbow Springs State Park, we weren’t in any hurry to leave Quail Run. By 10 am though we were pretty much ready to leave so we walked over to say good-bye to Phil and Carolyn who were also leaving that morning, heading for their home in West Palm Beach. In comparing our upcoming schedules we will be going to the same places (Lazy Days and Williston Crossings) but unfortunately on different dates. Oh well, we exchanged contact info so maybe our paths will cross somewhere in the future. Our propane meter was showing about 50% full (or empty depending on your perspective) so Rob wanted to get our tank filled on the way out of Quail Run. Our plan was to go through the exit gate, then pull over to the left hand side near the propane tanks but unfortunately there was another RV checking in (they were going to the site we just vacated) parked in the middle of the entrance, so he had to maneuver the coach into a parking lot next to the office and wait until there was more room. Finally the coach left and Rob was able to move our beast over to the propane tank. After putting 21.5 gallons into the tank (that was our total consumption since the beginning of November), we were on our way, taking a left out of the entrance headed towards I-75N. The weather was sunny with a forecast in the mid-60’s, but that changed early in the afternoon when another cold front moved through bringing a few showers. By the time we arrived in Dunnellon, the temp had dropped considerably and it was downright chilly! Be aware if you decide to visit Rainbow Springs you need to make your reservations (via Reserve America) early as this is a very popular park particularly on weekends. Also note that there are three separate entrances – one for the Campground, one for the Headsprings and one for the Tubing area. If we had followed Mrs. Rand McNally we would have ended up at the Headsprings entrance, luckily Mrs. Google had it right but probably only because Rob had used the satellite imagery to find the precise campground entrance. For reference, the correct campground entrance location is here or you can use the coordinates 29.088399 – 82.422096. 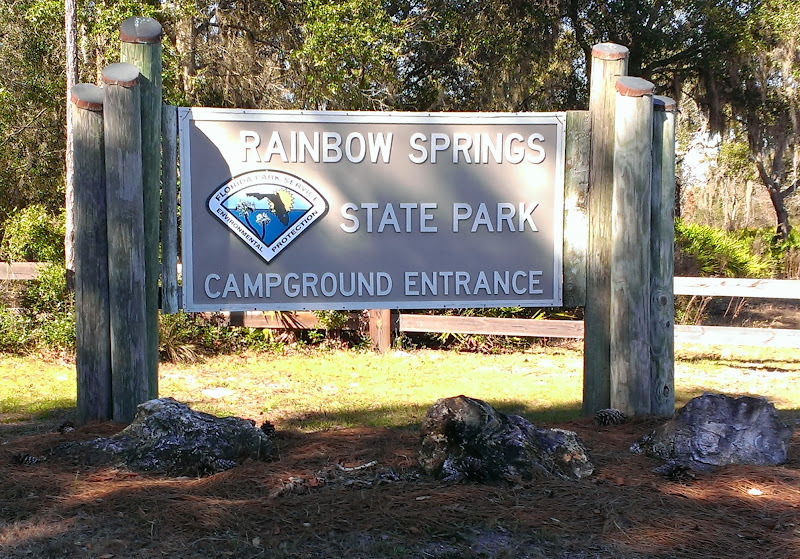 The campground is on the east side of the Rainbow River with the entrance located on S.W. 180th Avenue Road about two miles north of County Road 484 and two miles south of State Road 40. The Headsprings Entrance which is for day use only is on the west side of the Rainbow River and is located three miles north of Dunnellon on the east side of U.S. 41. Also be aware that at the intersection of U.S. 40 and U.S. 41, there is a narrow underpass that is 14’1″ high. Driving from the campground to the Headsprings takes about 15 minutes. With a canoe or kayak you could paddle upstream from the campground about a mile or so to reach the Headsprings. Arriving around 1 pm, we checked into the office where we were directed to the site we had reserved (#6) which is on Loop C. We strongly recommend loops B & C – the ones on A loop aren’t as private or as big. Sites here are fairly long – ours was 62′ but others in our loop were 72′ in length. Each gravel site has full hookups (water, electric and sewer), a picnic table, a fire ring and most are pretty private due to all of the shrubs surrounding each site. The picnic table and fire ring were tucked away to the side and were not visible from the road. There are really no bad sites here, but we would favor sites 5-23 along the outer perimeter for privacy with sites 7-10 looking particularly deep and private. 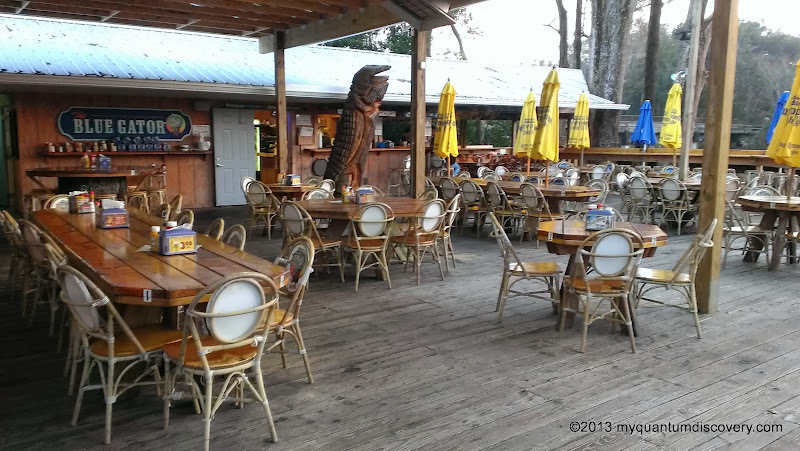 When we were checking in the ranger suggested a restaurant at the intersection of U.S. 41 & 488 that ha d outdoor seating by the Withlacoochee River. 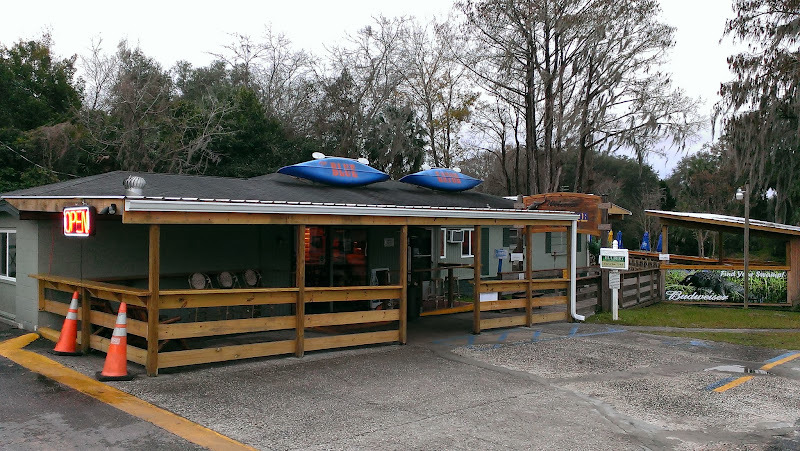 Although she neglected to tell us the name of the restaurant, Dunnellon isn’t that big so we were able to figure out that it was the Blue Gator Restaurant so we decided to go ther e for an early supper. Yippee, the chef was getting a night off! From the outside, the Blue Gator looks a little run down but it does have a nice outside seating area along the river (but also along the roadway) – too bad it was rather chilly so we opted to eat inside. We decided to have a 1/2 lb. 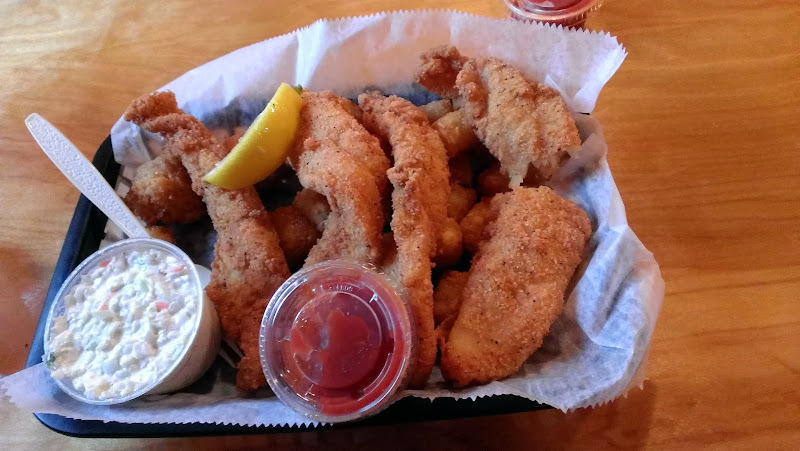 of peel and eat shrimp as an appetizer and fish & chips (which came with hush puppies and tater tots or fries). 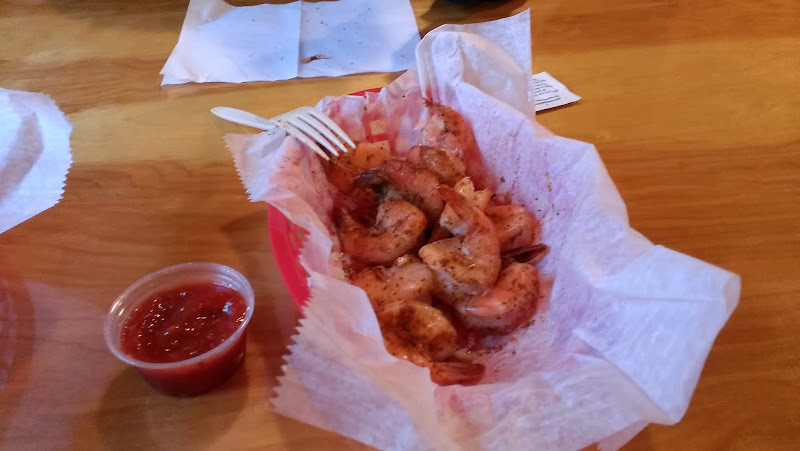 Usually we don’t like our shrimp seasoned but this was cooked perfectly and seasoned lightly. The fish & tator tots were excellent as well and since we each had four good size pieces of fish we took home kitty bags and had the leftovers for supper the next night. After we finished eating, we drove back to the campground and settled in for the night. Stay tuned for more adventures at Rainbow Springs!